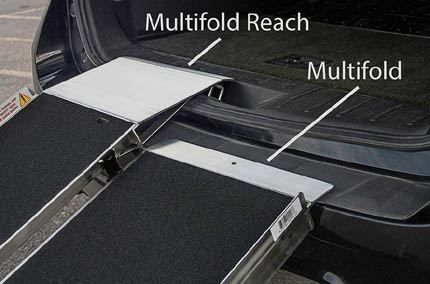 The utility Reach ramp, with the extended upper hook can clear the bumper on your vehicle for rear door entry use. The rear door utility ramp has a center joint design to eliminate pinch points and adds strength to the highest stress area of the ramp. These ramps are all aluminum construction with a high traction tape on the surface. The utility ramp is available in 6, 7, 8 foot lengths (rated for 800 pounds) and 10 foot lengths (rated for 700 pounds) and are 30 inches wide. For ramps with handrails, please see the Modular Ramp page , Ontrac Ramp page or the Commercial Ramps page. Ramps come with a Limited Lifetime Warranty and free shipping in the lower 48 states.